I’m on book deadline again, so I haven’t had a whole lot of craft time, but when one’s only niece is turning another year older and one is attending her party, one must also make a special birthday card. The kiddo loves horses, so I remembered just in time that I had an internationally printed sheet of dry decoupage with a unicorn on it. Close enough, I hoped. Besides, who doesn’t love unicorns right now? And even better, making the decoupage card was simpler than dreaming up something new. I’d been having trouble deciding which direction to go anyway. 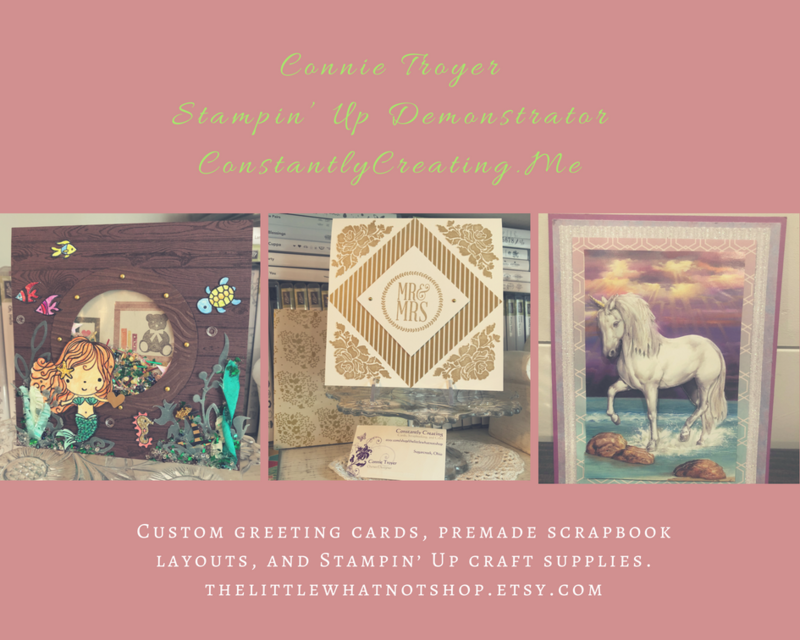 These decoupage pieces make fabulous card fronts once they are put together. There’s not usually room for much else. Once the unicorn was cut, fastened, and done, I just had to choose complimentary paper and cardstock. Kiddo also loves purple, I was told strongly on her birthday wish list (another reason this unicorn would work, because of the background). The Marvelous Magenta cardstock color was one of the best color-matching choices for the card base from my stash, and I had already pulled the ombré teal/purple geometric-patterned paper from a Recollections pad a couple of weeks ago, in case I wanted to use it for her card. I stumbled upon it again just in time. I rummaged a bit through my specialty paper drawer (a special unicorn for a special birthday deserves special paper, right?) and found a glittered corrugated cardboard/cardstock I’d never had the right feeling about before, and then I found a soft pink-and-purple paper that felt like it could be mulberry paper or handmade paper. Had to be extra careful not to crease it – they won’t come out! I decided how I wanted to layer them and cut each slightly larger than the last, for an A2 card base size. I cut the glittered cardboard from behind so I didn’t dull my blade – and I had to trim off the side fuzzies from the soft paper after I cut it. I adhered all the layers together with my ATG tape gun, hoping it would hold over the glittered piece (so far, so good)…and then I sat back, looked at it, and wanted to tinker. I ended up using my clear Wink of Stella glitter pen on the unicorn’s mane and tail. It’s super difficult to see in photos, but it dried nicely and is visible in person. I didn’t think there was enough room for a birthday message on the front, and I didn’t want to interrupt the beauty of the scene, so I didn’t add anything else. For the inside, I found a square piece of white cardstock laying in the random remnant pile that seems permanently next to my desk, but it wasn’t quite long enough, so I just trimmed off more geometric-patterned paper to put underneath it. It tied in with the front that way anyway. Then the square white piece looked too bland, so I took an old Marvy corner punch to all four corners. Cardmakers seem to remember to decorate the envelopes more frequently than I do…but I remembered this time! And I love how it turned out. I stamped the unicorn and the stars from the “Magical Day” stamp set in SU Coastal Cabana and Marvelous Magenta inks to match. I definitely need to remember to decorate them more often.